Phoenix Island, in Sanya, is one of many large-scale developments providing luxury hotels and boutique apartments. Sanya, the southernmost city in China, wants to position itself as the Oriental Miami to attract tourists from home and abroad. But if you’re talking about hotels, it may be even a step ahead of the city of pink flamencos and South Beach. In a 19-kilometer stretch of Haitang Bay in Sanya, there are plans to complete 40 five-star hotels in five years. Half of them will reportedly be operational before 2015, almost doubling the total number of hotels in the city. The massive buildup in the coastal city is illustrative of what’s happening throughout China as the number of luxury hotels, from both international and domestic hoteliers, rises quickly. According to Meadin.com, a web portal of the hotel industry in China, the country currently has 660 five-star hotels and another 500 under development or waiting for a five-star recognition. Many major international hotel companies have recently announced aggressive development plans in China, not only in first-tier cities, but also in second- and third-tier cities. The InterContinental Hotels Group (IHG), which currently manages 154 properties in China, has 142 in the pipeline. The number of hotels under development in China, which accounts for a quarter of the company’s total globally, is the highest among any hotel group, says Keith Barr, chief executive officer of IHG Greater China. "As the first international hotel company to have entered the Chinese market, we arrived here first and we want to stay," he says. The portfolio of Hilton Worldwide in China will increase fourfold by 2014 to 100 hotels. The move will make China the company’s second largest market after the United States. Marriot International Inc also has big plans. Every month over the next three years, one hotel under the Marriot brand will make its debut, says Simon Cooper, president and managing director for the Asia Pacific division for the company. Figures from the National Bureau of Statistics in China and the United Nations World Tourism Organization show that China will share the top spot with the US as the world’s largest hotel market by 2025 when China is expected to have 6.1 million hotel rooms, which is how many the US will have by that time. The Boston Consulting Group has predicted that China will surpass Japan to become the world’s second largest tourism market by 2013, holding an 8-percent share of the global market. The rising interest in travel has been a primary driving force for the ambitious expansion. The China National Tourism Administration said domestic travelers made 2.64 billion trips last year, 13 percent higher than the previous year. The number will further grow to 3.3 billion by 2015. At the same time, international travelers made 57.3 million trips, 2.3 percent higher than 2010. What is also fueling the development plans for international hotel chains have been their positive results. IHG’s annual report for 2011 showed that revenue per available room (RevPAR) in China increased 10.7 percent. RevPAR is a gauge of performance in the hotel industry and is determined by multiplying a hotel’s average daily room rate by its occupancy rate. RevPAR for IHG was up 17.4 percent, excluding Shanghai, which was impacted by strong numbers for much of the year due to the 2010 World Expo. In comparison, the company’s 2011 global RevPAR was 6.2 percent. Furthermore, the company’s revenue in China increased 15 percent to $205 million. Operating profit increased 24 percent to $67 million. The 2011 annual report for Starwood Hotels and Resorts Worldwide showed that 61 percent of the company’s pipeline of hotels will be in the Asia Pacific region, with 44 percent located in China alone. Last year, 28 percent of the company’s total management fees came from the Asia Pacific region, while 33.8 percent came from the US. Hoteliers say that major players in the industry will continue to establish themselves with their various brands designed for different markets. "Different sections of Shanghai requires different types of hotels. In commercial areas we could have Hilton or Doubletree. In a high-end area like the Bund we could have Conrad or Waldorf Astoria. The mainstream will always go to the Hilton brand," says Gerd Knaust, general manager of Hilton Shanghai, the first international hotel in the city. Another factor pushing the pedal on expansion has been the enthusiasm from local governments to improve their region’s profile as well as the elevation of prices on properties. 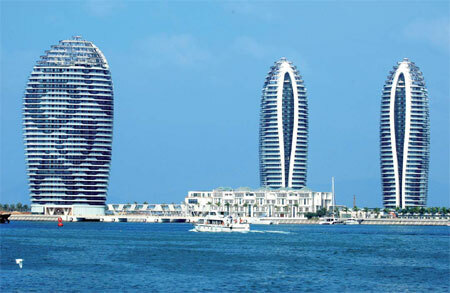 On Phoenix Island, a man-made island resort in Sanya, a hotel similar to the Burj Al Arab in Dubai (the fourth tallest hotel in the world) and a yacht marina are being built. Sales of the hotel property began at 18,000 yuan ($2,800, 2,180 euros) per square meter in January 2010, but is currently at a rate of 80,000 yuan. Zhao Huanyan, chief knowledge officer of Hotelsolution Consulting, a Shenzhen-based company devoted exclusively to the hotel industry, says that when real estate developers began developing a project, they envisioned building high-end hotels not simply for the purpose of making a profit. "Sometimes they build high-end hotels to increase the price of the office building and residence in the same project. And sometimes they are required by the local government to build those hotels to promote the image of the city," he says. "In this case, even if the hotel has poor performance, it can be compensated by the profits of the sales and rent of the office building and residence." Local governments, which see five-star hotels as a sign of the city’s broadening international appeal, also have strong incentives to encourage property developers to build hotels and attract international hotel chains to run them. When InterContinental Shanghai Puxi received the recognition by Chinese authorities as a national five-star hotel at the end of 2011, there were 53 five-star hotels in Shanghai, which is the fourth highest total in China. Chengdu, the provincial capital of Southwest China’s Sichuan province and which has 12 five-star hotels, will have 35 new five-star hotels in the next four years according to CBRE Group Inc, the world’s largest commercial real estate services firm. Changzhou, a medium-sized city about 200 km from Shanghai, has 10 five-star hotels; another nine will be added by the end of this year. But according to China Hotel Market Outlook 2011, increases in energy and operating and labor costs, rising inflation, pressures on occupancy because of the increasing number of hotels and high staff turnover are the major challenges that hotels in China are faced with. The survey was conducted by Jones Lang LaSalle Hotels and looked at 266 hotels in China. Almost half of the participants were five-star hotels and more than 34 percent were four-star establishments. Jones Lang LaSalle Hotels explained that driven by increases in the cost of sales and utilities, rising operating costs are the biggest concern for hotels. Typically, hoteliers hope to compensate by increasing operating costs incrementally in line with increases in revenue. There is, however, usually a time gap between increases in room rate and consumer acceptance. Survey results further indicate that immediate pressures on occupancy are greater than on room rate. If demand falls below supply, the increasing number of hotels will likely lead to a decline in occupancy rates. Cooper says that labor will be the biggest problem over the next 10 years. "The famous hotel brands can easily find good locations for their new hotels in smaller cities, rather than in big cities. But there will be not enough young people coming in the labor market. It is also hard to find employees in English in smaller cities, which is foreign brands’ work language," he says. Some industry observers have also sensed that there are too many hotels in the country’s hotel industry. "The comparison between the hotel occupancy in China and that in other countries shows the potential oversupply of the hotels rooms in China," Zhao says. Zhao says hotel occupancy in Amsterdam, Berlin, Hamburg, Munich and Paris in 2011 is all around 75 percent. The occupancy in London is at 85 percent. In comparison, the average occupancy in five-, four- and three-star hotels in China in 2011 is more than 60 percent. Wei Xiaoan, an expert in the economics of tourism with the China Tourism Academy, said at the 2011 Asia Hotel Forum that bubbles have started to appear in China’s hotel industry. He suggested a structured investment to prevent the bubbles. "There is an oversupply in the business hotels in the cities, but themed hotels, resorts and budget hotels are three promising areas for investment," he says.